The red Shiba Inu is the Shiba Inu that comes into everyone's mind when the term Shiba Inu is mentioned. The red Shiba Inu is both the most preferred and the most popular color of the Shiba Inu breed. Out of the four Shiba Inu coat colors, (red, black and tan, sesame, and cream), the red Shiba Inu stands out as the best ambassador for the Shiba Inu breed. The vibrant and bold color of the red Shiba Inu allows one to admire the fine structure and detail of a Shiba Inu body. These structural details are somewhat harder to admire from the other coat colors. The dark coat of the black and tan renders details of structural form into shadows, while the sesame Shiba Inu's complex markings and pattern can detract the viewer's eyes away from admiring the natural beauty of the Shiba Inu body structure. The cream Shiba Inus no-contrast, bright coat makes seeing any structural form almost impossible. An important characteristic of the Shiba Inu breed is a type of coat marking called the Urajiro. On cream Shiba Inus, this marking cannot be seen which is one of the reasons that cream Shiba Inus are non-standard and heavily faulted in show rings. Learn more about cream Shiba Inus here. The outer coat of a red Shiba Inu should be a deep, clear red. The undercoat should be grey / blue. The closer to pure deep red is preferred to lighter coats of red. The Nippo organization monitors the coat colors of Shiba Inus to look for signs of dilution of color or lightening. For Shiba Inu dogs and reds in particular, having a vibrant and rich color is an important breed characteristic. Any signs of coat lightening observed in Shiba lines is seen as a weakening of the Shiba Inu's genetic coat color codes. Red Shiba Inus With Black Tips - "Sashige" or "Dirty Red"
Red Shiba Inu coats that have black tipping or black "inserts" are referred to the Japanese as Sashige. The English term is "dirty red". The black tipping is usually found on the back and tail of red Shiba Inus. While clear red Shiba Inus are the preferred coat color - red Shiba Inus with black inserts are allowed in the show ring. 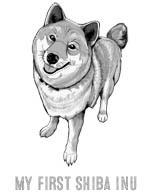 There was a time when officials at Nippo instructed Shiba Inu fanciers to breed out Sashige colored dogs. 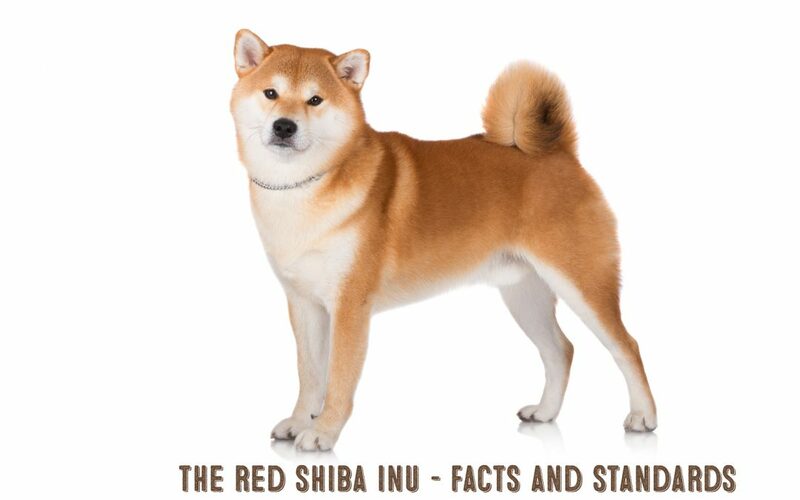 Their intention was to emphasize the pure red Shiba Inu as the correct specimen of the breed. However, they halted their recommendations when they realized that breeding out the Sashige Shiba Inus resulted in the dilution of coat colors in the other Shiba Inus. Now, the organization takes a more lenient approach to the Sashige or dirty red Shiba Inus. These Shiba Inus are still registered as "reds" in the registries. Many new Shiba Inu owners or those unfamiliar with the breed mistake their Sashige Shiba Inus with Sesame Shiba Inus. While dirty red Shiba Inus may have some characteristics of sesame - true sesame Shiba Inus are very rare. Learn more about sesame Shiba Inus here. The Shiba Inu dog is a native Japanese dog breed that has an ancestral lineage dating to 300 B.C. It is an ancient, basal dog that thrived in the mountainous regions of Japan. During the early 20th century, the Japanese began importing and admiring western dogs, resulting in the dilution of the native Japanese dog breeds. War, and illness further lowered the amount of pure Japanese dogs almost to the point of extinction. An organization called NIPPO formed to preserve and protect native Japanese dog breeds. At that point, not many pure Shiba dogs remained. The organization had to search in faraway landlocked regions where pure Japanese dogs could still be found. To save the Shiba Inu dog breed, three Shiba type dogs (San-In, Mino, and Kyushu) were bred together to produce the Shiba Inu dog breed that we know today. The Shiba Inu dog breed is relatively new dog breed to countries outside of Japan. Many who never heard of the breed mistake red Shiba Inus for foxes. Red Shiba Inu owners have had to endure countless strangers stating the obvious, "your dog looks like a fox!" Or, "did you know that your dog looks like a fox?" The natural, untouched beauty of red Shiba Inus gives us an example of what nature intended this dog breed to be. Owning a sturdily built and fluid structure, the Shiba Inu really does take on the wild appearance of foxes and even wolves. Due to efforts of Nippo to preserve the natural integrity of this ancient breed, the Shiba Inu's natural and wild form has escaped the perils of humans breeding dogs for specific traits and "looks" outside of their original form.